My mother loves all things coffee. From frozen coffee drinks to coffee ice cream, she's downright obsessed. 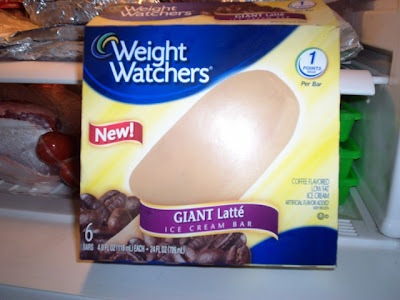 So naturally when we spotted the new Weight Watchers Giant Latte Bars at Stop & Shop a few weeks ago (on sale for $3.99), we just had to buy them. Although we're not following the Weight Watchers diet plan, it is nice to know that if we were, we would only be using one point for this yummy treat. THE VERDICT: COLD! I know what you're thinking: "Of course, you idiot. It's an ice cream bar." Seriously, because it is not coated in anything, when you take a bite of it, you get straight ice cream in between your teeth. After the initial shock, you are able to taste the strong coffee flavor in this delicious bar. It is creamy, flavorful, and a great way to have something sweet and not mess up your diet. Also, this bar is much larger (hence the "giant" nickname) than most of the ice cream bars you find in the supermarket - always a plus in our book.